Non-tipping wheeled cart for high-volume, medium weight work. Compatible with dumper systems -- eliminates the lifting, carrying and hand emptying of buckets of barrels. Wide mouth and low profile design. Easy to load and tip-resistant. Made from high molecular weight, high density, UV-stabilized polyethylene for durability -- UV stabilized material will retain color for a lifetime. Oil and chemical resistant. Thermo-forming creates a smooth finish for easy cleaning. Frame is made from 16 ga. zinc-plated steel tubing for sure support of loads up to 450 lbs. Complete with large grab handles at both ends for convenience. 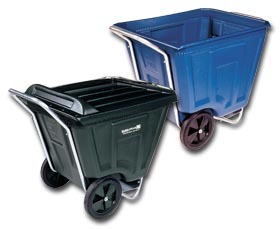 Carts with convex lids allow over-stuffing -- heavy duty piano hinge keeps lip popped open during use. Smooth rolling casters are located in front for stability -- eliminates the need to elevate cart legs for easier maneuvering. Available only in Gray . FOB Shipping Point. Product No. Cap. (gal.) Load Rating (lbs.) Overall W x D x H Lid Wt. (lbs.) Price Ea.